Why is this website named "ExcelsiorPress.org" when most of my content is about my own printing on my Chandler & Price, Heidelberg and Vandercook presses? Well, I named the shop when I was twelve years old (about 45 years ago) and the only press I had at the time was my little 3x5 Kelsey Excelsior. It seemed a good idea at the time, and, although I have moved on to much larger presses for my work, the old Kelsey Excelsior is the classic 'first press' every young printer should start with. And, since I did name my shop after that press, and do have a few and also now have a web presence, I get many inquiries about the Kelsey Excelsior Press. To meet that need, I am working on this little (but growing) web page to answer these questions more conveniently. 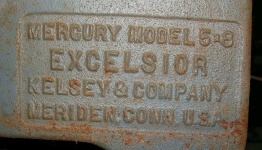 The Kelsey Company manufactured the Excelsior Press for about 100 years (1875-1975) with minor changes. Since it was the inspiration for my print shop name, I have kept my original 3x5 and have collected a few more over the years. They have come from garages, basements and print shops. As we encounter duplicates - as well as broken presses and parts, we will be offering Kelsey Presses & re-constituted starter kits for sale from this web site as well. Some of our Kelsey Presses lined up, awaiting restoration. a 3x5 Kelsey Old Style carried in a Gym Bag! 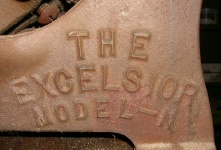 Popular sizes of the Excelsior Press were 3x5, 5x8 & 6x10, as shown above. The dimensions roughly relate to the print area of the press - and the size of paper it could handle practically. The early series 3x5 & 5x8 presses, (#1 & #2 in the photo above) can be identified as Kelsey's "old style" presses by their square and molded handles. The 6x10 to the right has the later style square handle. The two to the far right are "Victor" presses with side-arm levers. More about them on the Victor page (coming). This is a Kelsey "Junior" or Model-R made for printing cards or anything that will fit in it's tiny, 2.3/5" chase. Click the photo for a very well detailed larger image. A 5x8 Mercury is a very viable hobbyist press and, assuming the chase and ink table are still with it, should need only new rollers to be fully functional. These presses currently sell on eBay for $150-$450, $350-$600 or more, depending upon condition, ink rollers, and any additional type and tools may be in the package. Do you want to print with it, sell it or display it on a shelf? All three are viable options. They are interesting little machines with an a well-documented history. The Smithsonian did a display a few years ago entitled "A Boy and His Press", specifically focused on the Kelsey press and other similar presses popular among boy printers from 1875 to 1925. 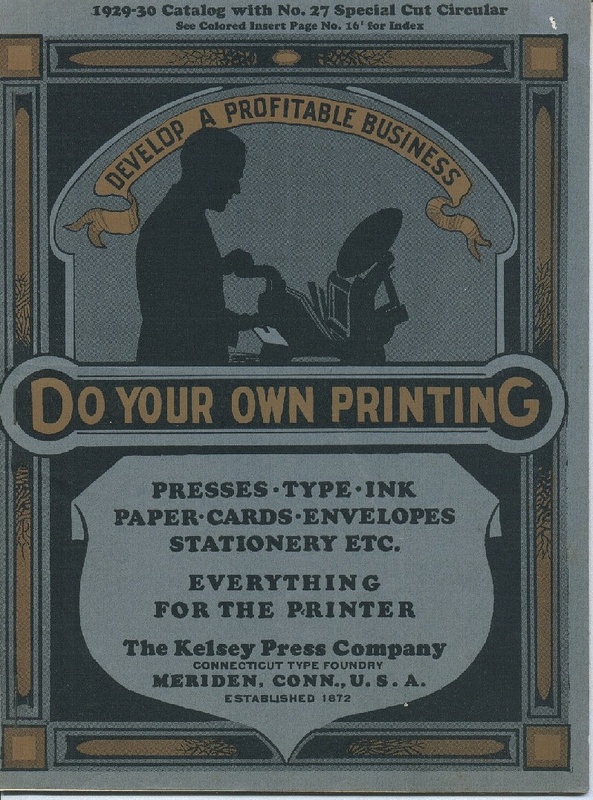 After that, Kelsey was the only serious supplier of such presses. First, you will most likely need some new rollers. 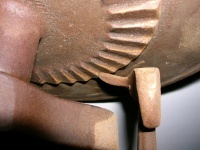 Most presses turning up these days have not been used or maintained for many years and their rolllers have deteriorated. It is quite rare to buy a press which does have good rollers. Even rubber rollers will degrade within 7 years in many cases. David Hauser of Tarheel Roller in North Carolina continues to make high quality composition rollers for these (and other) letter presses. AND, now offers letterpress rollers made from soft rubber 20 durometer Buna N material. Call Tarheel for soft rubber prices. Tod's Presstime sells Kelsey rollers on eBay. Ramco Roller in San Dimas, Calif. makes rollers for all sizes of platen presses. Excelsior Press also casts fresh rubber rollers for all presses in our collection we make our own cores, cast our own rollers and turn custom roller trucks on our own lathe. Even if your press is not in our collection, we should be able to make custom rollers that will fit and work well on your press. 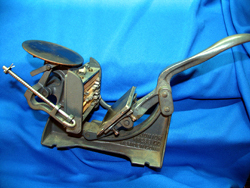 Briar Press.org - THE online hand press museum. Here's their Kelsey Page. Don Black - The Ludlow Matrix King - in Toronto also has some good info on the Kelsey Company. 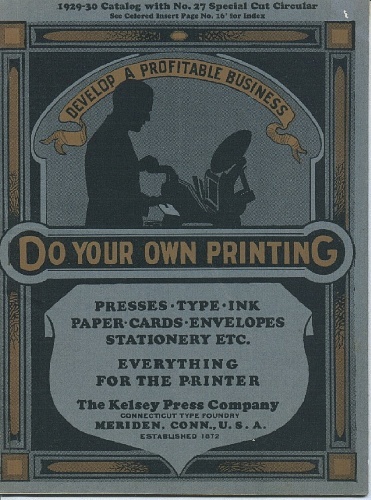 Buy a well-scanned reprint of the classic Kelsey Printer's Guide - from the Scan wizard -for $9.89 +$2-8 shipping. NA Graphics supports Kelsey presses. See their website/catalog for details. Presses' values are totally based upon what the buyer and seller agree upon. Kelsey built these presses for over 100 years and they exist all over the country, but the supply is limited. Old rollers, roller trucks, chase bars & paper grippers are often lost as well and will need to be replaced. Roller hooks may be bent or missing. We are making new ones and will be listing them for sale soon. Wholesale or "rough shape" (rusty or missing major parts) value has increased a bit to $200-400 $100-300 from the ~ $50-100 they could be had for in 2006. During May-October of 2007, there seemed to be 2-5 Kelsey Excelsiors on eBay at any one time, and nearly all sell, so it's probably a fair assessment to say that 2-5 are selling each week on eBay this year (2008). By 2010, the market seems to have slowed somewhat, with prices still at 2007 levels and overall eBay sales down somewhat. Thanks for visiting my web site and for your inquiry. The first thing I have to point out is that pricing on old Kelsey presses varies widely. I typically pay $50-200 for presses I buy to restore. Sometimes I will go as high as $300. But these are for presses that need work - or at least dis-assembly, cleaning, new rollers and often new grippers or roller hooks - which I manufacture here in my workshop. My friend (and former student) Dennis recently sold this press and type and cabinet for $700 - http://www.briarpress.org/27712 Look around Briar Press' classifieds and other discussions to see what others' opinions and experience might be. Briar Press has 60,000 members world wide now and boy, do they love to share their opinions! ;) er, I mean you wil find many folks on Briar Press who are willing to help. Type in cases is hard to sell - by which I mean, there is a very limited market in type these days. * Many if not most of the new printers on the scene today prefer to use photo-engravings or photo-polymer plates of images (including text) which they prepare on their computer. It's also hard to evaluate the value of type in cases. Since most of the type found with Kelsey presses is indeed Kelsy-cast type, it's generally considered "Monotype" quality vs "Foundry" quality - based upon the composition of the metal and the machine it was cast on. "Montoype" quality is still being cast by various private foundries using Thompson casters. For example, Quaker City Type Foundry casts small fonts on a Thompson - as did Kelsey, and sells it for $20-30/ font. Only Dale Guild Type Foundry continues to cast the hard-metal, high-quality "ATF"-style type that brings $50-100/font used and costs $125/font new. It is pretty easy to identify which "type" of type you have there. The Thompson caster cuts only one "nick" on the stem of the type. ATF and other "hard foundry type" are identified by 1-4 nicks on the stem, in varying positions, depending upon the font. The Thompson-cast type also a higher lead content - which makes it softer and less hardy over years of wear - and also typically makes it a brigher color. ATF included nickel in their mix, which gives a darker - but more reflective "color" to the type. My guess is that you have Kelsey cases and Kelsey type and a standard selection of 6-24 point size, some text, some sans-serif and possibly some larger display or script faces. If you have a list, it would be very helpful. You probably also have at least one composing stick, and possibly a small slug cutter. This is all part of the typical kit and anyone who invested in 20 cases of type, probably did enough work to justify buying lead and slug spacing in bulk and cutting it themselves. You probably also have a large selection of wood blocking known as "furniture". I sell individual blocks of newly trimmed and oiled furnitur for about $1 each, so yours can reasonably be valued at .25/piece for purposes of quick calculation. New type in clean cases would probably cost $50 or so to replace. But when someone buys a "lot" of type in cases, the value is based more upon what they need and want compared to what you have. I don't always paint the presses I restore, but I do set them up, adjust the impression and rollers and print with them to make sure that my buyers go home with a press they can use right away. I prefer to sell in person and often have them print on their press here in my shop before they take it home. My presses typically sell for about $850-$1500. Many other "restorers" do not take this extra step, but their presses look nice and new, so folks often buy them and then come to me - or go to Briar Press - or a local print-arts center - for help setting them up. Lou Colvecchio in Rhode Island (whose presses are the pretty painted ones featured on my site) sandblasts and paints the presses he restores and often casts and/or machines replacement parts. His presses sell for $1250++. Others who are seriously involved in restoration can get similar prices. But one last thing that will be very important when you sell your press is making arrangements to get it to the buyer. Shipping this press properly - by which I mean safely packed so that it won't be damaged in transit should cost at least $50 - just for the press. Shipping type is a whole other story. Try to find someone nearby who can come and see the press and carry the press and type home in the back of a van. That will make life easier for you and will also mean safer transit for both the press and the type. You may just list it on your local Craigslist A classified listing featuring "local pickup in on Briar Press will also bring a lot of interest. You may not get the highest possible price, but you will find the entire sales experience less complex and more enjoyable - you'll probably meet a very nice new printer-to-be. Sounds like you probably have a "complete setup" there. Of course, a lot also depends on just how much your buyer can afford. While what you have there may indeed be worth $1,000 or more, finding someone with $1,000 to spend might take some time. Where can I buy or sell such a press? These presses have not been made new for the past 40 years, but some are being restored to like new condition. Note: Louis has retired from the restoration business as of 2012. Louis would also buy used presses and restore them to like new - or better than new - condition. You may find one at a garage sale or consignment shop - even from the PAWN STARS on tv. They bought a broken 6x10 for $25 in January. Good deals can be had. The most effective and secure packing I've seen is to ship in a heavy-duty double-corrogated cardboard carton with a double layer of corrugated cardboard or a piece of plywood cut to fit the bottom, then insert the press into a standard trash bag, put it into the box and fill in the surrounding space with plastic peanuts and finally fill the gaps with a $5 can of expanding insulation foam (available at Home Depot, Lowes or your local hardware store). It makes a good solid package and should not add much to the weight. I received a 5x8 Kelsey that was packed this way and it was fully protected from being rolled over or dropped a foot or two. Shipping with the USPS could be more cost-effective than UPS or Fed Ex for a package of this size and weight. Compare prices. Important note! A recent sad event resulted in a press packed by UPS being broken upon arrival. If it had been packed as suggested above, this would not have happened. Replacements for presses damaged in transit are not always available. The supply of these presses is limited. "I'll have to find a better way to pack the presses. I thought I did a really careful job, but I can't imagine the beating that these must take during shipment. Sigh." To prevent such a disaster for the next press shipped, I am adding one important suggestion: Bolt your press down to a base board so that it can not fall over and be crushed from the side, no matter how much the shippers toss it around. We will pack a 5x8 using these suggestions and other reasonable ideas and create a special page devoted to proper packing and shipping a 5x8 Kelsey for survival... Watch her for an update or contact me if you need to see it soon. We also have a nice 8x12 and a beautiful old 10x15 (sold) - both New Series - which we have had for years but are now available for the same price as the Pilot. Shipping or delivery can be arranged. And, of course, if you can make to Frenchtown, NJ, personalized training in the operation of any of the presses we sell can be easily arranged. And, please note that ALL proceeds of equipment, supplies or printing sold by the Excelsior Press goes to support the continued existance of this shop. It does NOT go into my pocket. Each month, we have to come up with $650 (was $600 until 2011) to pay the rent. Everything we earn in sales - and printing - goes to pay the rent and to rescue letterpress equipment so that it's here for you when you need it. For the past 20+ years, all shop expenses have come out of earnings from other sources, but since those sources can no longer support the collection, the shop must support itself in order to survive... Your purchases help keep the Excelsior Press - and this web site going. If these prices seem higher than what you see bid on eBay, consider this: Unlike the "caveat emptor" gamble of buying something that was found in a basement or garage and has been listed eBay, presses we sell come from our shop and are proven to be working - with new rollers, a supply of packing sheets and a test print made on the press prior to shipping. Note: There are some excellent press restorers (some are our friends, in fact) who are selling truly fine presses on eBay, but most of the small presses sold on eBay come with no assurance whatsoever, and many are sold lacking such basics as ink tables, chases and chase beds. Few, if any come with usable rollers. * note: the 3x5's use the same ink disk. On the early series 3x5, (square handle), they are struck upward from the left. On the newer series (round handle), the striker comes down on the right. The striker dogs look different and one goes up, while the other goes down, buty they both go clockwise, so the disks are interchangeable. The 5x8's however, are different. The disks actually rotate in different directions and the driving tabs beneath the disk face in different directions. . I recently discovered what I will refer to as a "little known fact" about the Kelsey Excelsior Press Ink Tables. The ink table on the earlier models, such as our Excelsior Model N 5x8 press, rotates in a counter-clockwise direction, while ink tables on the later models, such as the Mercury 5x8 and other newer models, rotate in a clockwise direction. The presses' handles are also slightly different, so that might be a hint for the press owner looking for an ink table so that he or she can identify this important difference. Note the angle of the ratchet and the direction of the hammer stroke. Note the different hammer and the ratchet teeth that are sloped in the opposite direction. But why did they change? But that would happen whether rotation was clockwise or counter-clockwise, upstroke or downstroke. The difference on the Kelsey press is whether the table rotates as the rollers approach it or as they leave it. Still seems to make no difference to me. Maybe Kelsey just copied the C&P Pilot and the C&P Pilot just followed the standard set by the bigger C&P job presses... Any other ideas are welcome. This press has a patent date of 1893, and can be identified by the 4 very large flat head screws used to level the platen. It also has an extremely large hammer to drive the ink disk rotation - larger than the ones shown on our Ink Disk discussion.The chase bed is cast with wedges where newer models have pins or set screws to set the bottom position of the chase as it fits in. This chase bed is also about 6 points wider than the one used on newer models, although they are interchangeable. But the old style chase will not fit in the new style chase bed. It's just too tight. Newer chases fit into the older chase bed, so that's no problem. Otherwise, it looks a lot like the Model N,O,P,U Models we see more frequently these days. But the new style roller hooks are made of 3/8" round rod; the holes in the roller saddle of this "1893 model" are drilled for 5/16". 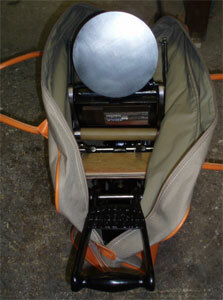 3/8" roller hooks might work, but would be undersized for this press' saddle. It needs 5/16" hooks - same as the larger 6x10 presses. But these 5/16" 5x8 Roller hooks are not generally available. We have some, we may make some, but most folks making hooks these days make the 3/8" hooks made for the later model 5x8's. These older style hooks are not much in demand, and are much harder to fabricate than the simple round 3/8" hooks. 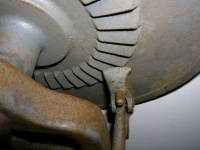 The roller hooks used for this older model are made of 5/16", not 3/8" steel rod. But on this model, the hook stock was heated and flattened before being bent into position. In addition, the hooks were drilled to allow small pins to be inserted to keep the roller shafts within the hook. When the Kelsey Press was shipped from the factory, along with it came a small package of tympan packing sheets to be used on the platen. The bottom sheet was typically a hard, red, heavily calendered* pressboard. Above it would go a sheet of calendered & oiled paper, then perhaps a sheet of bond, and finally, holding it all in place - and as a place to set in your gauge pins, a larger sheet of oiled tympan which was larger and would clamp the rest beneath the bails of the platen. I have seen people use butcher paper, kraft wrapping paper and cardboard. I have even found presses packed with newspaper. But I do not recommend ad-hoc selections like these, although one sheet of newprint is fine right below the tympan sheet. They will work, and if you're on a budget or simply don't want to buy a small package of papers, that's fine. But for the best impression of type onto paper, the harder packing base is best. note: Be sure your platen is level and set to the proper distance from the bed. Don't try to make up for too large a gap with too much packing, or too little gap with less then 3 sheets of something between the type and the steel. I have larger presses and a good stock or large sheets of oiled typman, and am considering offering some for sale. No one needs much, so the packages would be small - 50-100 sheets or so. And I have sheets for the Vandercook Model 4, which could also be used for the SP-15 and I do plan to cut some down for C&P's and Kelsey Press sizes and offering them in small lots to the occassional printer. Soon I expect to advertise them or maybe sell them on eBay as "Excelsior Packing". But if you want some before I'm ready to take orders online, you can contact me and let me know of your interest. Please tell me the size of your press, how many sheets you would like to buy and what you think is a fair price for them. * hard papers are "calendered" by rolling them between two very large, very heavy steel cylinders under a tremoundous amount of pressure, effectively removing all moisture and air and forcing the paper fibers closer together to make a very hard surface. top I will add more photos and details here to share what I know about the Kelsey Excelsior Press and the Kelsey company in general - including their offices in Meridan, Connecticut and the warm welcome I received from Gene Moser when I visited there in January of 1973.
top KELSEY ORDER FORMS ATTRACT STAMP COLLECTORS! News! 9/05/2006: I recently met a neighbor here in Frenchtown who is a stamp collector. Back in the '80's he bought a collection of papers for the stamps that were on them. What he bought was about 1/2 of the Kelsey sales records for about 50 years! Stamps from around the world, affixed to that familiar Kelsey fold-up order blank that some of you may remember came with every Kelsey catalog and price list. Most of these old order forms have been sold to stamp collectors around the world, none of them realizing the historical record they had contained something every bit as precious as the stamps that were on them. News! 3/30/2010: I received a call last week from Gene Mosher - the last owner of The Kelsey Company. He has a collection of over 150 old Kelsey Catalogs - some over 100 years old! These may become availble for collectors some time in the near future. We will update this page with information as plans develop. Please contact webmaster & printer Alan Runfeldt with other questions.